SignalR Streaming is the latest addition to SignalR library and it supports sending fragments of data to clients as soon as it becomes available, instead of waiting for all the data to become available. 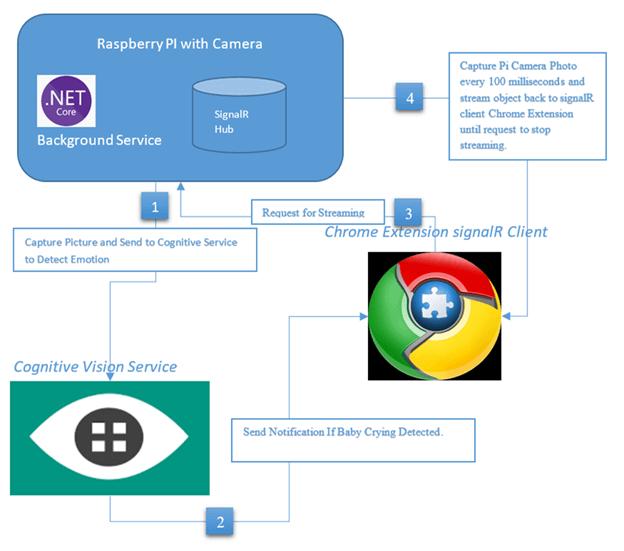 In this article, we will build a small app for baby monitoring to stream the camera content from Raspberry PI using SignalR streaming. 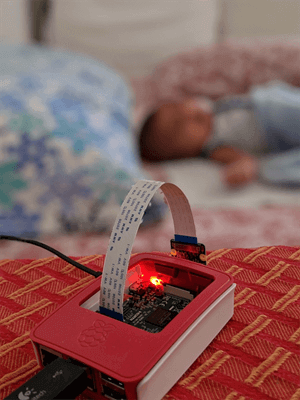 This tool also sends a notification to connected clients whenever it detects a baby cry using Cognitive Vision Service. This tool consists of the following modules. SignalR Streaming Hub which holds the methods for streaming data and notification service. .NET core based worker service that runs in the background thread to detect if the baby cries, by capturing photos on a frequent interval and passing it to the Cognitive Vision Service. Azure based Cognitive Vision Service will take the image input and detect if any human face exists and then, it will analyze the face attributes and send the response back with face attribute values, such as - smile, sadness, anger, etc. PiMonitRHub is streaming hub which holds two streaming methods - startstream and stopstream. When the SignalR client invokes the startstream method, it calls the camera service to capture the photo and sends it to the client by writing into the ChannelWriter. Whenever an object is written to the ChannelWriter, that object is immediately sent to the client. In the end, the ChannelWriter is completed to tell the client the stream is closed by the writer.TryComplete mMethod. 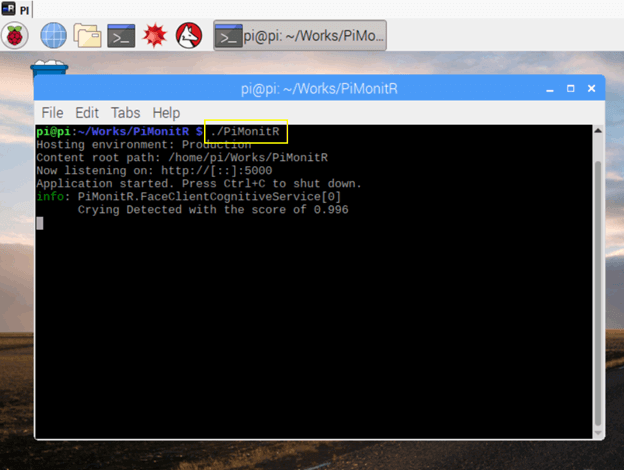 PiMonitRWorker is a worker service inheriting from the background service. It starts a new thread whenever the application is started and executes the logic inside the ExecuteAsync method at a frequent interval until the cancellationtoken is requested. In this worker service, it captures the photo using camera service and sends it to the Cognitive Service API to detect the baby cry. If the baby cry is detected, the notification hub method broadcasts the notification message to all connected clients. 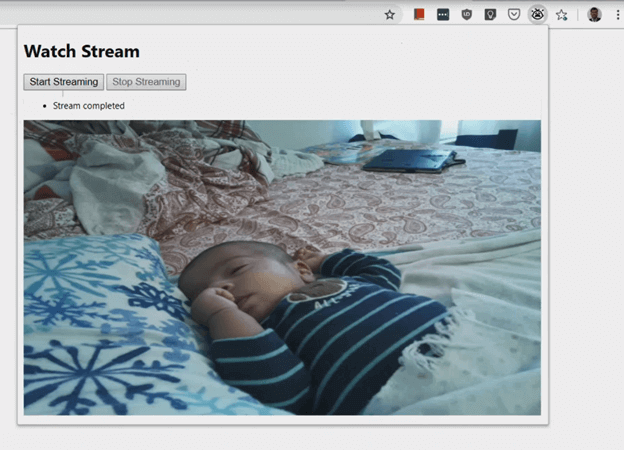 If the client is already watching the stream, this background service will not detect the baby cry until the user stopped watching the stream, to avoid duplicate notification to the users. Microsoft Cognitive Service API is a very powerful API to provide the power of AI in a few lines of code. 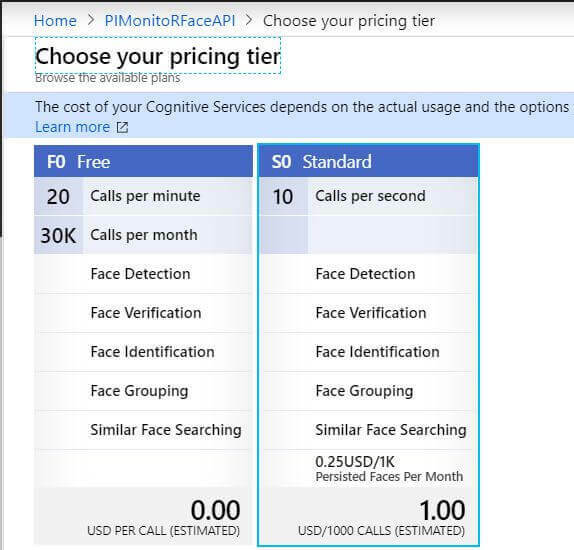 There are various Cognitive Service APIs available. In this app, I will be using the Cognitive Vision API to detect the face emotion to see if the baby is crying or not. This API will analyze the given photo to detect, recognize the human face, and analyze the emotion face attributes, such as smile, sadness, etc. Best of all, this service has a free tier which allows 20 calls per minute, so we can get started without paying for anything. 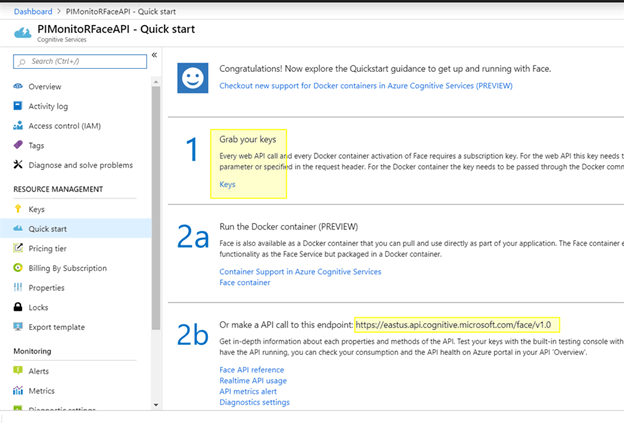 After you register the Cognitive Service on the Azure portal, you will get the API endpoint and the Keys from the portal. You can store the Keys and EndPointURL into UserSecrets / AppSettings / Azure Key Vault so that we can access it from configuration API. Face API has got so many face attributes for the identified face. But, for our app, we use the emotion attributes of Sadness, Anger, Fear. If anyone of the above-mentioned attributes is higher than 0.5 limit, this method will return true. I came up with 0.5 as a limit for these attributes. However, you can change the value or attributes that work for your use case. I have tested with few crying images and my limit works fine for all those cases. I am running my Raspberry PI with Raspian OS which is based on Linux ARM architecture. The camera module has a built-in command line tool called Raspistill to take the picture; however, I wanted to use some C# wrapper library to capture the picture from Pi and found out this wonderful open source project called MMALSharp which is an unofficial C# API for the Raspberry Pi camera and it supports Mono 4.x and .NET Standard 2.0. Now that we are done with server side app coding, our next step is to deploy it into Raspberry PI. In order to publish the app into PI, there are two different ways to publish it. I used self-containment to deploy so that all the dependencies are part of the deployment. The following publish command will generate the final output with all the dependencies. After all the files are copied, I connected my Raspberry Pi through a remote connection and run the app with the following command in the terminal. I decided to go with chrome extension as my SignalR client because it supports real-time notification and also, it doesn’t need any server to host the app. In this client app, I have background script which will initialize the SignalR connection with hub and runs in the background to receive any notification from the hub. It also has a popup window which will have the start and stop streaming buttons to invoke the streaming and view the streaming output. manifest.json will define the background scripts, icons, and permissions that are needed for this extension. background.js will initiate the SignalR connection with hub with the defined URL. We also need signalr.js in the same folder. 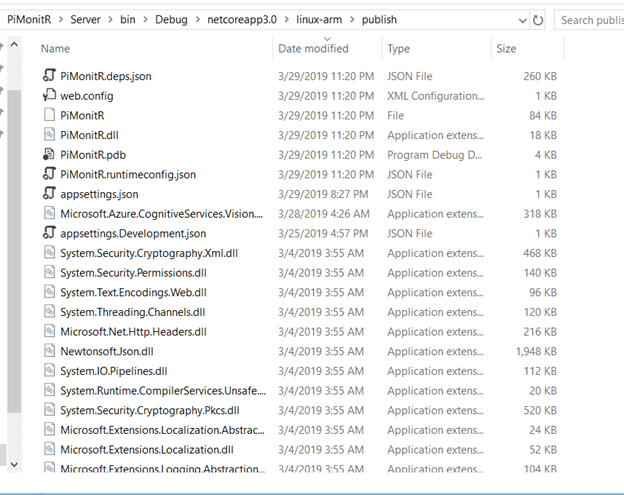 In order to get the signalr.js file, we need to install SignalR npm package and copy the signalr.js file from node_modules\@aspnet\signalr\dist\browser folder. This background script will keep our SignalR client active and when it receives the notification from hub, it will show a Chrome notification like below. popup html will show the stream content when the "Start streaming" button is clicked. It will complete the stream when the "Stop streaming" button is clicked. When the user clicks the start streaming button, it will invoke the stream hub method (StartStream) and subscribe to it. Whenever hub sends the data, it receives the content and sets that value directly to the Image src attribute. When the user clicks the stop streaming button, client invokes the StopStream hub method which will set the _isStreamRunning Property to false which will complete the stream. This is a fun project I wanted to experiment with SignalR streaming. Well, it worked as I expected. Soon, we are going to have a lot more new stuff coming in SignalR (IAsyncEnumerable) which will make even better for many other real-time scenarios. I have uploaded the source code in my GitHub repository.